The Logical Fallacy of the Futility of Passion – Love. Life. Practice. I am not a tremendously logical man. I wish I was; it's probably part of why statistics thrill me so much. It's taken me a while, but there was always something about the whole If you follow your passion, you're very unlikely to be happy or successful because you'll be financially insecure argument. With the help of some Venn diagrams, I think I've figured out why it doesn't quite make sense to me. If you look at this diagram, you can see the people who are “successful” (based on the idea of “happy and financially secure” as the measure of success) in the middle. To the left are all the people who listen to conventional wisdom and relegate their passion to a hobby, picking out someone else's dream to pay their bills. Most Americans are unhappy at their work, but a good portion are, so they fill a lot of the “successful” circle. Then to the right is the much smaller circle of those who followed their passion, and the even smaller slice that are successful in that. 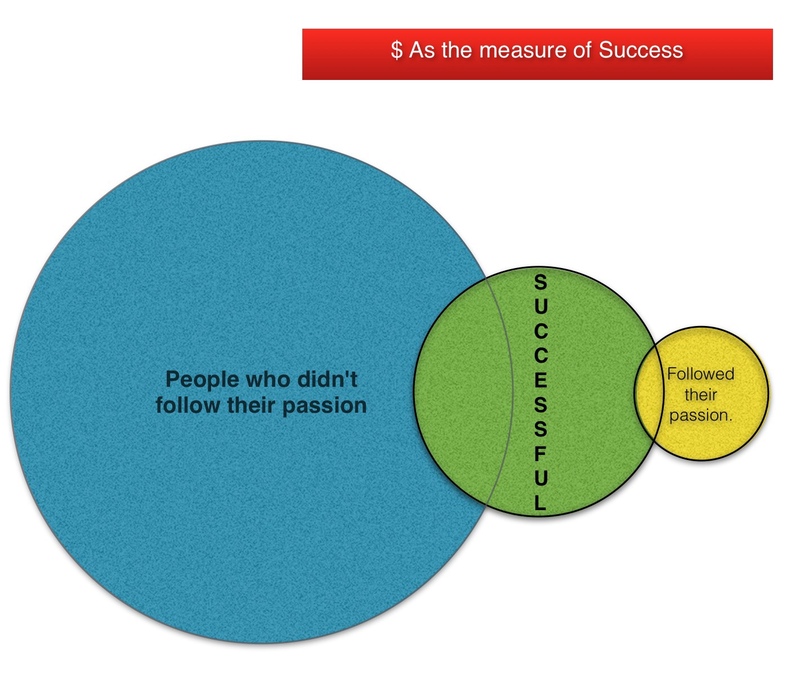 Based on the discussions I've had with people on both sides of the “follow your passion” argument, I'm pretty sure this is accurate. Here's my question: both the “follow” and “don't follow” sides have a lot of people who are not happy or not financially secure or both. What do those people do? They try to find a new job that will make them happy and financially secure (I'm not sure why I keep separating those two things; the argument of the “don't follow” folks is based on the idea that they are inseparable). If the new job doesn't fill the needs – either of enough money or of being a way they can handle spending their time – then they find a new job. That cycle – of finding a new job until you find one that fulfills your definition of “success” financially – is the same regardless of whether you follow your passion or not. The fallacy with “If you follow your passion you will likely be poor and unhappy” is the implication that not following your passion will make you rich and happy. It just ain't so! Whether you follow your passion or not, if you live in the capitalist system you are going to keep trying to find work that satisfies your needs. That's how the system works. I feel that a reasonable measure of “success” in life is the amount of regret you have at the end. 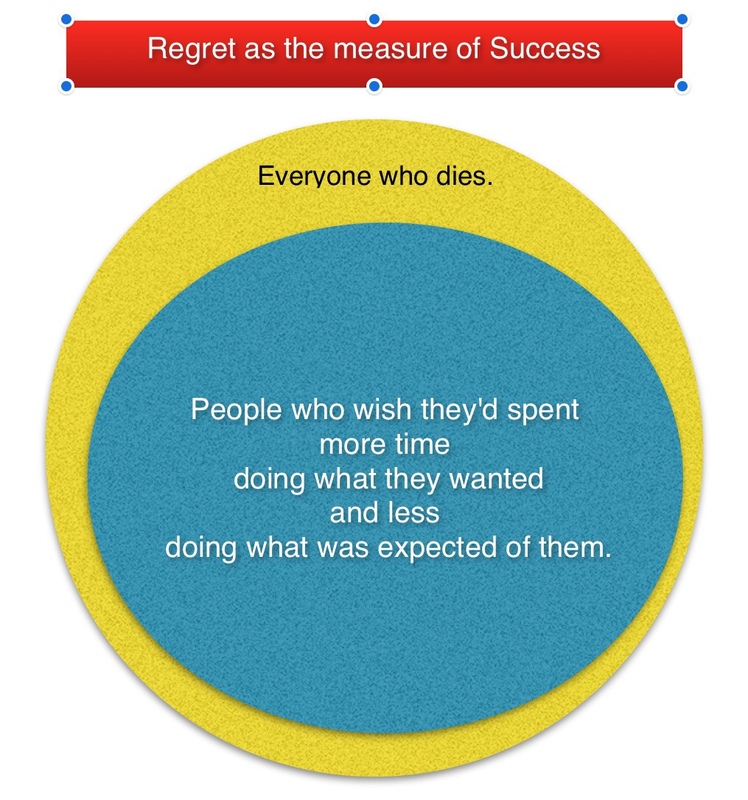 Less regret equals a more successful life – let's stipulate that. Obviously Twain's observation of “Lies, damn lies, and statistics” applies here. I can draw Venn diagrams all day and not convince people one way or another. I will even agree that by choosing to not follow your dreams you do increase your odds of being successful – at least in terms of there being a wider range of occupations to choose from. However, I think it's pretty obvious that you would also be significantly increasing your odds of falling into that larger blue circle in the second diagram as well. It's a choice; just be aware you're making it. There is an assumption there that having regrets means if one had gone ahead and done what they wanted, that they also wouldn’t have lived to regret those decisions as well. Every decision we make changes lives. We can never know how it would have worked out had we made an opposite one. We can only assume that if we regret the one we made, then the other would have turned out better. The grass is greener supposition. My personal take is finding the good in what we do/did and realizing nothing is lost until we devalue the worth of our efforts. Reading those two quotes, I find myself agreeing with Ruiz far more than Alcott. I have quite a lot of cherished plans and failures under me; while I do find myself in a version of “heaven”, it is in spite of those things, not because of them. You’re right, we can never know how things would have worked out; yet it seems to me that the path to a satisfied life is more likely to lead in the direction of passion than of compromise.